Sony hires American Gods writer Maria Merkil for the upcoming Faith movie. So the shooting on Bloodshot has started with Vin Diesel. Such a great character and the movie will be rated R as it sounds like the entire Valiant movie universe will be. This will be the first of five with Bloodshot and, later, Harbinger. I really didn't think anything would actually get made, color me surprised. Considering all that's been happening with the company as of late, this might all just be posturing to boost the company's value ahead of a sale. I was excited about Valiant going multimedia for so long, but the recent DMG buyout has left me disheartened and skeptical. It's shooting and it's real. Bloodshot is the character they're banking on, who's a character I love. Valiant is kicking off its movie universe with Vin Diesel's Bloodshot, and now we might have our first full look at him as the character. As part of the charity fundraiser Game4Paul, Vin Diesel partnered with Xbox to provide a number of items to help raise money for Walker's charity Reach Out WorldWide. One of those items is a limited to one signed copy of Bloodshot Salvation #12, which is signed by Diesel. It was drawn by Diesel's favorite Bloodshot artist Lewis LaRosa, and reveals Diesel's likeness as Bloodshot for the first time. As you can see from the image below, if nothing really changes form this point on in production the character is going to look pretty spot-on compared to the character in the comics. Diesel is forgoing any armor on his upper body here, with all the focus going towards the character's trademark bloody red circle on his chest. Bloodshot doesn't really worry that much about getting shot with that handy healing ability, but he is up for dealing out damage thanks to those two pistols he's holding. You can check out the full description for the variant below. The rarest Bloodshot comic book EVER produced – signed by Vin Diesel, star of Sony's upcoming BLOODSHOT feature film! Specially manufactured for Game4Paul, this ONE-OF-A-KIND edition of the BLOODSHOT SALVATION #12 comic book comes complete with an exclusive cover featuring art by legendary comic artist Lewis LaRosa, imagining superstar Vin Diesel as Valiant's relentless comic-book hero and signed by Diesel himself! 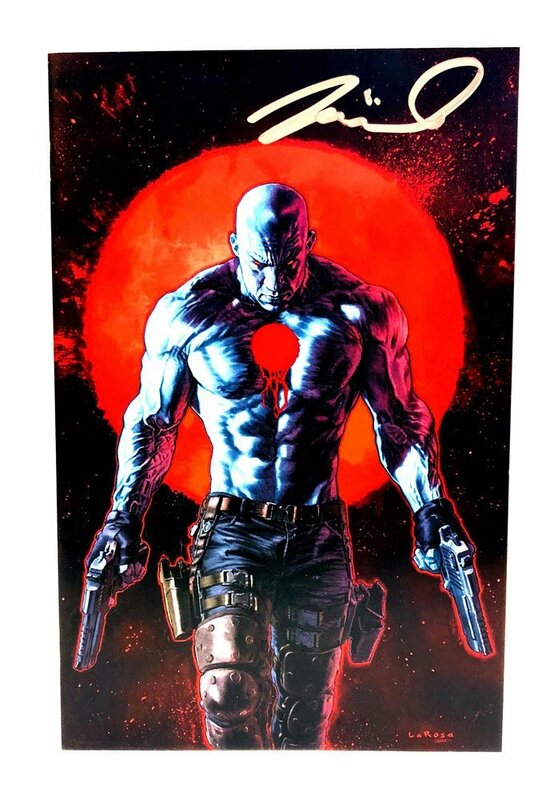 The art for this truly unique collectible was originally commissioned by former Valiant CEO & Chief Creative Officer Dinesh Shamdasani at the request of BLOODSHOT director Dave Wilson, who gave the art to star Vin Diesel as a gift and reveals Diesel's likeness as the character for the first time, as rendered by his favorite Bloodshot artist, Lewis LaRosa. There will be plenty of other amazing prizes given out as part of the Game4Paul event, and you can find out even more about it right here! Game4Paul will be airing on Tiltify, Twitch Xbox Channel, Mixer Xbox Channel, and Cody Walker’s Facebook Page today at 11 am ET/1 pm PT, so make sure to tune in! The article notes that Bloodshot just wrapped shooting in Africa and that the third film will pit Bloodshot against Harbinger, with the fourth and fifth movies being Archer & Armstrong and Shadowman.